Zombies are any creature or person that has died and been temporarily resurrected. Zombies are still capable of warfare despite no longer being able to think for themselves; thus, they are often used as extra bodies in a fight. Zombies are most typically created by vampires and necromancers for use in combat; however, you may also create your own. 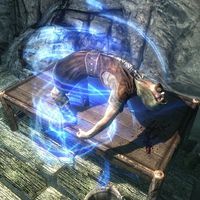 Zombies are typically resurrected through the use of a temporary reanimation spell or enchantment. For more details about the use of zombies as allies, see this page. 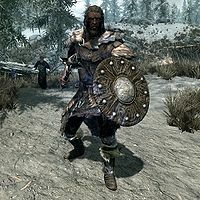 Most NPC zombies will groan while animated and may say "Must...kill,", "You...must...die," and "Kill," while in combat. They will occasionally make comments indicating gratefulness for release from their undeath upon defeat. Zombies disintegrate into lootable ash piles at death or once the reanimation spell effect wears off. They cannot be soul trapped because they've already died before. Plague of the Dead adds a new Zombie creature. Similar in appearance to Ash Spawn, these zombies wield generic one-handed weapons and drop an ingredient called Mort Flesh. Zombie hordes can be encountered randomly as a world interaction or as part of the related quest, The Rising Dead. They can also be summoned and encountered at set spawn points in the world. All zombies have frost resistance, magic resistance, poison immunity, and waterbreathing. Most zombies have a weakness to fire, except for Dread Zombies, which also have a natural health regeneration ability during combat. Zombies can't cast spells however, as they have no magicka. In general, aside from abilities, zombies have similar stats (if not identical) to Draugr, with each version having a counterpart. 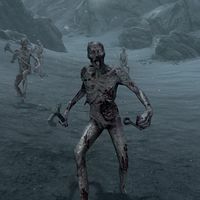 The Zombie is equivalent to the Draugr, Foul Zombie to Restless Draugr, Putrid Zombie to Draugr Wight, Malignant Zombie to Draugr Scourge, Relentless Zombie to Draugr Deathlord, and Dread Zombie to Draugr Death Overlord. Zombies wield a leveled one-handed or two-handed melee weapon. They are initially of iron or steel quality, while Orcish start to appear at level 9, Dwarven at level 15, and elven at level 22, though iron and steel are four times more likely to appear than the other types. †This version of the Malignant Zombie has the wrong stats applied, it appears in a leveled list along with its stronger variant. ‡This is the version summoned by the conjuration spell. Note that they benefit from the Dark Souls perk, despite not technically being reanimated. This page was last modified on 13 March 2019, at 21:51.